Caley Thistle defender Brad Mckay believes keeping clean sheets holds the key to the Highlanders prolonging their 19-match league unbeaten streak. Inverness remain the only team yet to taste defeat eight games into the Championship campaign, as part of a longer unbeaten league run which stretches back to March. Despite the fine form, which has left John Robertson’s men five points adrift of league leaders Ayr United, Caley Jags have been left frustrated at drawing four of their five home matches so far this term. Mckay has been part of a backline that has kept 12 shut-outs during that sequence and the former Hearts defender is intent on maintaining his side’s resilience, with Inverness away to Dundee United this weekend. Mckay said: “We are a tough nut to crack. As a defender a clean sheet is what you want to see. If you keep clean sheets, you don’t lose games and you’ve got a chance. If you end up nicking a goal it’s a bonus. “It’s nothing to be worried about, it’s a couple of draws at home, but we are looking to turn them into wins. “We can come off disappointed, but it could be worse, we could come off losing by one or two goals. “It’s a crazy league. To go 19 games unbeaten is mad, given the results you see. 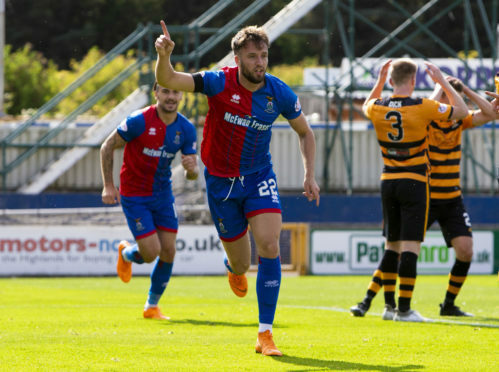 Mckay insists Caley Jags have learned what to expect in the Championship having initially struggled following relegation from the top-flight in 2017, however the 25-year-old still feels his side commands the respect of opposition teams. He added: “It’s a scalp for everyone when you come down from the big league. Partick Thistle have found it difficult, and we had it as well last year. “We saw Partick come here and we put the game to bed after 25 minutes. We were there last year, we went to Dunfermline and got hammered 5-1. “It’s difficult to adapt. It’s a mad league, teams set up strange sometimes when you expect them to have a go at you, but they sit in. “We have been in the league for a while now and teams do respect us.